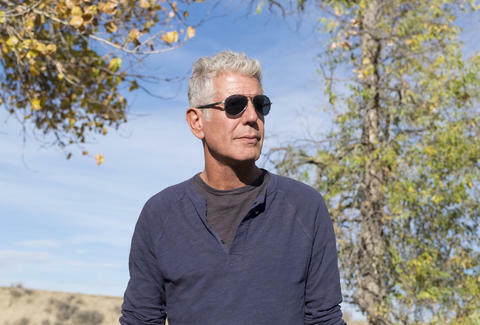 With the premiere of season 8 of Parts Unknown on CNN this fall, the start of a national live tour in early October, and the release of his latest cookbook in late October, it's really no wonder that Anthony Bourdain has more than 23,000 unread emails. The stress-inducing number is just one of several interesting tidbits revealed about the globetrotting celebrity chef's iPhone in a new interview with The Wall Street Journal, including his favorite apps for traveling. He has less than 100 contacts saved on his phone. Uber, Google Maps, Flight Tracker, iTunes, and Netflix are his "most-essential" apps while traveling. The artist he listens to the most lately: The Kills. The most surprising app that he depends on? The List App. Check out the full interview over at The Wall Street Journal. They even got him to reveal the last Uber ride he took and what game he wants to delete from his phone the most. Unfortunately, there's no mention of Pokémon Go, but then again, that's probably for the best. Tony Merevick is Cities News Editor at Thrillist and would quickly lose his mind if he had thousands of unread emails. Send news tips to news@thrillist.com and follow him on Twitter @tonymerevick.